Why have a Non Surgical Face Lift at Therapy House? If you would like to have a facelift but you have concerns about the recovery time and the permanent and invasive nature of a surgical treatment, then it would be worth you having a consultation about a non-surgical facelift. Here at Dawn Attewell Aesthetics, we can use a variety of treatment methods, either independently or in combination to achieve a rejuvenating Non Surgical Face Lift without you having to go under the knife. As we move through our 20s into our 30s and beyond, our skin begins to lose some of its youthful fullness and definition. This is because our natural stores of hyaluronic acid, collagen and elastin all begin to deplete. At the same time, the repeated movement of our facial muscles can cause lines and wrinkles to appear. 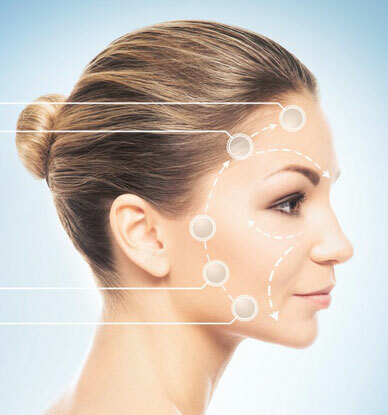 To achieve a Non Surgical Face Lift, we can use treatments such as Accent XL radiofrequency therapy, Harmony XL Pro, Exilis Elite, 3d Skin Med (Hifu), dermal fillers and MD CodesTM – including an 8-point lift – and/or wrinkle reducing injections. It may be necessary to combine several treatments for the best results. What treatments can be used to create a non-surgical facelift? With Accent XL Radiofrequency Therapy, we can heat the cells within your skin to stimulate your body’s healing response, causing it to create fresh collagen, elastin and other skin repairing factors. This tightens and realigns your skin, giving it a firmer and more defined appearance.The treatment also boosts your blood circulation, shrinks fatty cells, and drains toxins via your lymphatic system, cleansing the environment in which your skin cells grow. This will help your skin to look and feel healthier, stronger and thicker.Accent XL works well on any area of the face, lifting and tightening the skin. It can even be used around the eye area, and is particularly effective for giving you a younger, better defined jaw line. The 8-point lift is an exciting treatment where we use dermal fillers at eight key points of your face to address a number of lines and wrinkles, and restore lost volume. With an 8-point lift, we can take a more holistic approach to create better symmetry and balance, and enhance the overall appearance of your features. This treatment can achieve a subtle but effective face lift without the need for surgery.We have adopted the use of MD CodesTM, which are a series of formulated injection points for dermal fillers proven to elevate, rejuvenate and enhance, as well as delivering natural results. Read more about MD CodesTM. Smooth, clear and radiant skin is strongly associated with youth in today’s society, but the effects of ageing and sun damage can cause skin imperfections such as fine lines, wrinkles, sun spots, loose skin and uneven skin tone. To address these issues, we can use a ClearLiftTM laser treatment and high-powered Near-Infrared technology to stimulate collagen production and give you smoother, younger and healthier-looking skin, as well as creating a gentle lift. Harmony XL Pro also offers Pixel Skin Rejuvenation – this is a tone and texture treatment using light and laser-based skin resurfacing technologies to improve your skin tone and texture, and create elasticity so that your skin looks firmer and lifted. Wrinkle reducing injections work by blocking the signals to targeted facial muscles. It is possible to use these injections to stop certain muscles from pulling downwards. Once these muscles become inactive, it creates an immediate lift as the muscles that pull upwards have the chance to work without an opposing force. At your initial consultation, we will spend some time talking to you, analysing your skin, and creating a treatment plan. Again, how soon you see results will depend on the treatment(s) you have to achieve your non-surgical facelift. Dermal fillers give immediate results, whereas the effects of wrinkle reducing injections can take five to ten days to emerge. Accent XL and Harmony XL Pro both offer some immediate results and ongoing improvements as your skin creates new collagen and elastin. Again, this will depend on the nature of your treatment. We will discuss how long we think the results will last during your initial consultation and treatment appointment. All of the treatments we recommend to achieve a non-surgical facelift have proven safety records. Accent XL directs radiofrequency energy to the precise areas of your face that we want to lift, whereas the Harmony XL Pro ClearLiftTM and Pixel Skin Rejuvenation modules use light and/or laser energy. Thousands of patients have been treated safely and successfully worldwide using both the Accent and Harmony systems. You may notice a slight redness or swelling, which should disappear in less than 24 hours. Read more about the side effects associated with dermal fillers and wrinkle reducing injections. Most people are able to carry on with everyday life after a non-surgical facelift, but if you do experience swelling, bruising or redness, you may want to arrange to take some downtime until these side effects subside. You will be given detailed aftercare instructions that relate to your procedure, as our recommendations will depend on the treatments we use to achieve your non-surgical facelift. Want to know more about Non Surgical Face Lift?